Nadège, could you talk about what brought you to cinema, and a bit about your background? I came to cinema through a desire to make a different kind of television programming, since I am originally a journalist reporter. Before 2007 the Congolese media was community based. I wanted my work to have a larger audience. It all began in 2001 when I went to Pointe-Noire, Congo’s second city, for vacation. I joined a team of a dozen young people who had applied to the TPT (TV for All), one of the first private television stations in Congo, to train in journalism. We were asked to create the editorial office. The instructor, Mr. Dulcine Pambou, an important Congolese journalist, saw in me an adventurous spirit and so I found myself part of the news reporting crew. From there my great adventure in the media began, lasting until 2004. Between June 2004 and December 2006, I worked in a big restaurant both as cashier and in charge of marketing. But a year and a half later, as the French proverb goes, "what is bred in the bone will come out in the flesh," the desire to work in television return to me, by way of cinema. So I worked on a project about street children, which I wanted to transform into a film documentary. But having never trained in filmmaking, I collaborated with the director Alain Nkodia to produce the film Ndako ya bandeko, le combat de Rod. A year later I completed my second film Ku nkélo, and presently I am working on my third film, Dallas de Paris, the product of a film workshop that I attended in Paris last spring. And many other projects as well. You collaborated with Alain Nkodia on the film Ndako ya bandeko, which was presented at the Cannes festival in 2007. What were your experiences in making the film? Ndako bandeko ago, le combat of Rod, was both an exciting and painful adventure. Let me explain: When I went to Alain Nkodia with my footage on the story of street children, I was motivated by an intense but naïve passion. Not knowing the ropes of filmmaking, I got taken in on this investment. But let's say it was my initiation rite. Thanks to the film I was able to mix with the world of street children and I can tell you that this is a very complex world. In this sense it can be both harsh and fascinating, as one gets an up-close look. Thanks to the young boy Rod, the other children accepted us very openly. And today when I meet a street child I experience a special feeling towards him/her: a respect pure and simple. What was the reception of the film? The film was very well received. And Rod, the protagonist of the film, with sickle cell anemia, diabetes, an orphan with neither father nor mother, a child of the street, is now a medical student in Paris and living under good conditions. The film has been presented in several festivals and every time I screen it at the Festival des 7 Quartiers in Brazzaville, the public is always full of excitement. You attended Africadoc. Would you describe the training program and the projects in which you participated? When the first Africadoc training workshop took place in Brazzaville, it was through my friend and filmmaker Rufin Mbou Mikima that I join the group. Though I had already co-directed the film, Ndako ya bandeko, I wanted to do the training to fill the gaps I had in this area. It was a godsend. Throughout the two weeks that I worked on my project, "The War of Succession", I learned the ecriture of a documentary film. And although the film has not yet been made, I can say that this training helped me a lot during my subsequent projects. Your film, Ku N'kelo, looking for water, what moved you to broach the subject of water in Congo? "Ku N'kelo" is a rant against the authorities of our country, given the dire situation of the scarcity of drinking water in Congo. When I made the film I did not think that it would have such a widespread effect. But it was at that moment that I did realized that the water problem was a global problem. Why did it turn out to be such a controversial film? This outrage took hold of me one day when I returned home from work. I had received a water bill though it was already two months since I had not received a drop of water at my house. I began to understand the rip-off by the SNDE (Sociéte Nationale de Distribution d'Eau). So at that moment I asked myself the question: why do we live in such a situation when we are surrounded by water? Thus, the subject being among the taboos of society, the controversy was created by itself. 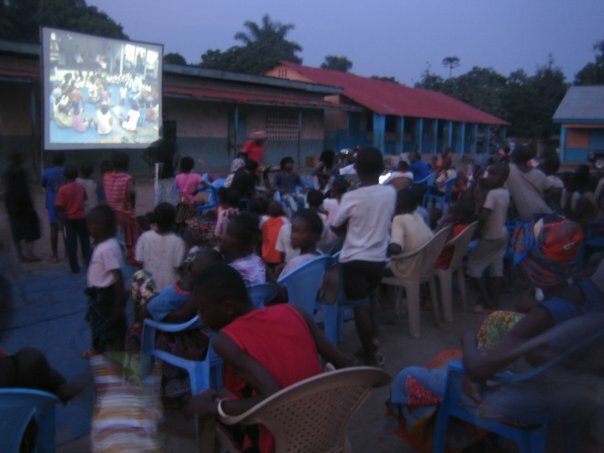 Some reflections on cinema in Congo-Brazzaville? The problem of cinema in Congo Brazzaville (as in several other areas) is a matter of governance. But hey! We hope that when each of us understands what must be done, things will change. For the moment we hope for the best. I see that you are very active in the audiovisual world. What are your projects at the present? 2010 was a busy year. Just after the end of the second edition of the Festival des 7 Quartiers last December. I was accepted at the Ateliers Varan in Paris for a three-month documentary film workshop. For my film project I worked on a 30-minute documentary called Dallas of Paris about a follower of the SAPE (Society of Ambiance Makers and Elegant People). When I returned to Congo, I was hired as a cameraperson by BONZ Communication, a production company based in France, to shoot a film about the first fifty years of the Congo: Colours of the Congo, directed by Hassim Tall. For a whole month I filmed the entire southern part of my country and I discovered the riches that encompasses it. Since last August I am working on the second season of "Les Boulistes.” Co-produced and co-directed with another director, Amour Sauveur, "The Bowls Players" is a 6-minute, twelve-episode sitcom comedy. Already selected at two festivals: FESTEL 2009 (Cameroon) and the Rotterdam Festival 2010, this series was born in 2009 with a great deal of will and few resources. But for this second season, we have secured funding from UNFPA (United Nations Fund for Population Activities). At the same time, I am in the preparation stages of the third edition of the *Festival des 7 Quartiers to be held from 6 to 12 December 2010. Although I know where I am headed, I cannot predict the future. But what is certain is that I will make a film in the near future. In 2011, I will attend the Rotterdam Festival Rotterdam and FESPACO, and elsewhere, God willing. Thank you very much! *The mobile cinema of the seven (7) neighborhoods is a festival that takes place every 4 months for seven (7) days within seven (7) districts of Brazzaville. It allows the Congolese people to be in constant contact with their cinema in order to restore the cultural identity that has been lost for decades. On the occasion of the 3rd edition of 7 Quartiers, honors to the women filmmakers of the Congo and elsewhere: young Congolese filmmakers Annette Kouamba Matondo, Tsietsi Noelle, and Monique Phoba of the Congo Kinshasa.